Christine has been living with mental illness for over 20 years. Her journey has been a rollercoaster, and sadly saw her lose custody temporarily of her four children. Regaining her health and custody of her children should have been a happy time for Christine. But sadly, she was diagnosed with Frontotemporal Dementia and had to be cared for in an aged care nursing home. This was a difficult transition for Christine, as she was the youngest resident in the facility where many patients faced vastly different health concerns than her. As the nursing home was focused on aged care and offered no mental health supports, she said she felt lost and cut off from any dementia or community mental health support services, and the services she did come into contact with did not believe her story. During this time, Christine’s mental health deteriorated and she attempted suicide. Unable to access any support through the public health system, Christine then turned to the private health system for support on her journey. 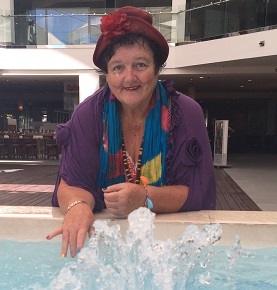 This is when she met Currumbin Clinic and Partners In Recovery (PIR), which Christine says were her salvation. Christine has been able to reclaim her life, with the help of PIR and all her wonderful local mental health support network. PIR has assisted Christine financially with a private nurse after she was discharged from the Currumbin Clinic, helped her to get medication delivered until another ongoing service became available, as well as provided Christine with a fridge and a bed. PIR also set up Christine’s support team of Aftercare, Churches of Christ, mental health nurses and others. Christine said “We sat around a table and worked out the problems of what needed to be done which should have been done in the public system”. While the future is not certain for Christine, she is now happy to take each day as it comes. “I live each day with a smile” she said. Christine has completed the VOICEBOX Program where she shared her story about being in the nursing home. She also received a grant to produce 1,000 sample bags containing mental health messages, which were distributed via GPs, clinics, pharmacies, and the 2015 Wellness Festival. Christine is now an artist, is in the Memory Group in the Currumbin Clinic, and has just finished working with Activate Your Voice. She also works out in the pool of her studio apartment, which is another aspect of her recovery which PIR assisted with. Christine has also written a book, Tears and Laughter of Dementia and Alzheimer’s, which has recently been published. To purchase a copy of Christine’s book, please email [email protected].